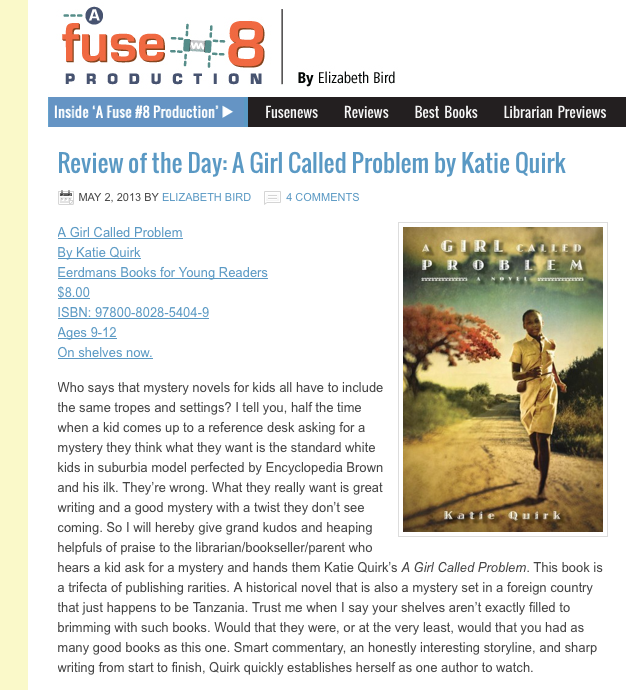 Elizabeth Bird of Fuse #8 at School Library Journal just wrote an amazing review of A Girl Called Problem. This woman is major royalty in the middle-grade and young-adult universe. She’s served on the Newbery committee, written for Horn Book, and weaves together the most intelligent, thorough, and sassy reviews out there. Talk about voice! It’s such an honor to have her review the book. Here’s a snapshot of the beginning of the review–ain’t it pretty?–and here’s the full review. Read the full review at Fuse #8. This entry was posted in A Girl Called Problem and tagged Elizabeth Bird, Fuse #8, school library journal, SLJ. Bookmark the permalink. And today Betsy starts off an important conversation about the paucity of black male protagonists in middle-grade fiction this year by mentioning A GIRL CALLED PROBLEM again. Two nods from Betsy, woot!